Let’s start at the beginning, with a true Texas tale that still echoes today. It’s July, 1857. On the west bank of the San Marcos River, war hero and statesman Sam Houston stops to stump for the governorship of the state he recently helped create. The settlers of the new town of San Marcos rally around to hear a man who had become known nationwide for both his grit and his thoughtful eloquence. In those days, a speech like that brought the community together. Banners are hung. Music is played. And in the shade of an enormous live oak, Sam Houston, standing on an overturned bucket, makes his case. Behind him is a Texas flag newly made by some of the ladies of San Marcos, in preparation for the visit. He’s so impressed with their generosity that after his speech, during the handshakes and back slaps, he finds this group of women and thanks each of them with a kiss on the cheek. Now in 1857, that had just a touch of impropriety, and it gave people something to talk about. Enough so that the majestic live oak, standing in the cool breeze of the river, became known as The Kissing Tree. Let’s jump back in time to 1709 when the first recorded explorer, a missionary named Isidro Félix de Espinosa, blazed a trail through Hays County. Over the next 130 years, more travelers followed that trail and expanded it, linking Austin and San Antonio. The spot where Kissing Tree is located today was originally called Stringtown—a small outpost along this important road. Between 1850 and 1856, log houses, a general store, a Brown & Tarbox stagecoach stop, and a one-room schoolhouse sprung up. Ever since, this little corner of Texas has been a center of activity and a place where communities can grow. It’s a fascinating area, full of inspiration, and compelling characters. Through the Civil War, the excitement and turmoil of the 20th Century, and right up until present day, there’s a rich history to discover. It’s a classic Texas tale of determination, adventure and new beginnings. Our community has been designed to make the most of this special place, with wide hill country vistas from expansive porches, and big, sun-drenched windows. It’s a feeling that’s not only rooted in this spot—it’s something that just couldn’t exist anywhere else. And now, let’s take a look at today. And tomorrow. Let’s imagine for a moment. Right now, Kissing Tree is in the earliest stages. The first homes are being completed. The amenities are coming together. New neighbors are shaking hands for the first time. The air is ripe with possibilities. And that’s just how we designed it. It’s an Active Adult Community that’s custom-built with a Texas attitude. That means a focus on community perfectly balanced with independence. It’s a home for design and architecture that fits here, and only here. It’s a place where you can live life on your own terms. And if that’s not Texas, what is? That Texas attitude is the perfect match for a community that’s designed for residents 55 and better. It’s not only a home, but a home base for planning your adventures and following your dreams. For kids born in the 1950’s into the early 1960’s, America was a uniquely optimistic place. Peace and prosperity were the norm. Rights were being expanded and rules re-examined. As this generation came of age, they also took charge, shaping the culture and re-imagining what it means to live in a truly free and rapidly modernizing country. And as they grew older, much of that youthful optimism remained. Today, that generation is healthier, more active, and more engaged than any generation that came before. 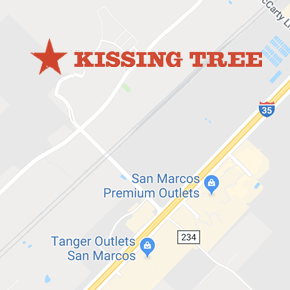 Kissing Tree is one of the first 55+ communities in Texas to be designed and built specifically for the energy and attitude of this generation. We’ve listened. We’ve collaborated. And we’ve carefully crafted a vision that combines a timeless feeling of place with modern technology and amenities. Everything here is planned with purpose, and made to match this generation, at this time in their lives. For many people, life at 55+ is the first time they’ve had in years to really focus on exercise, eating better and setting fitness goals. In fact, many people tell us that they’re healthier in their 50’s than they were when they placed more importance on their careers and raising kids. This new focus on self means they’re looking to take on new challenges. Hike a 14’er in Colorado. Explore the differences between Hatha, Vinyasa and Ashtanga in their yoga practice. Take a motorcycle journey to British Columbia. These dreams are as individual as the dreamers. Kissing Tree is a place to plan your adventures. It’s a community where there’s always something else to do, and someone to do it with. Food is life. And a big part of living healthier is focusing on what we’re eating, where it comes from, and how it’s made. The social aspect of food—cooking, sharing, pairing—puts it at the center of our lives. That’s why the homes at Kissing Tree feature expansive kitchens for entertaining and creating with friends. You can also enjoy our Texas-sized community barbecue pit, and indoor/outdoor bar, and a friendly biergarten. Plus, we’ve incorporated a community Food Studio into our master plan. It’s a place to learn new recipes—from brisket to bouillabaisse—from master chefs. All while sharing these creations with friends and neighbors. 55+ is a time when many people find more freedom to enjoy the works of others and find new outlets for self-expression. Whether it’s a mini film festival, a community pottery throw, or musicians and guitar lessons imported from Austin, you’ll find plenty to occupy your mind and your hands. And because we’re in a college town, there are nearly unlimited opportunities to attend classes, and maybe even teach the next generation. Expression and artistry are vitally important to a fulfilling, happy life. At Kissing Tree, your talents will be honed. Your interests entertained. And, apologies if this sounds if this sounds a little highfalutin, but it’s a place where your soul can flourish. San Marcos: Is “Perfect” Too Strong? Maybe Not. San Marcos, Texas. If you already know, you know. But if you’re a little green behind the ears, here’s the lowdown. Nestled in the rolling Texas hill country, halfway between the tech and music capital of Austin, and the culture, cuisine and history of San Antonio, San Marcos is a thriving, fast-growing town that retains its main street charm. The climate is among the mildest in the state, with sunny warmth, but lower humidity. There are cool rivers to float and fish, clear lakes for boating, amazing scenery and wildlife, and winding back country roads for exploring on two or four wheels. Add in nearby college sports, and music venues from Sixth Street in Austin to world-famous Gruene Hall. And don’t even get us started on the barbecue. It’s a half hour to a major airport, and shopping abounds—from quaint mom and pop boutiques to major outlet malls. Kissing Tree is a new community that’s part of an established town. Most everything you need is five minutes away. That makes daily life incredibly convenient. But maybe the best part is the people. That authentic, heartfelt Texas hospitality is the real deal here. San Marcos is at the center of everything that’s great about Texas. We’re not really bragging when we say it just might be one of the most perfect places on earth.